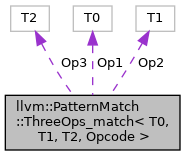 Definition at line 1060 of file PatternMatch.h. Definition at line 1065 of file PatternMatch.h. Definition at line 1068 of file PatternMatch.h. Definition at line 1061 of file PatternMatch.h. Definition at line 1062 of file PatternMatch.h. Definition at line 1063 of file PatternMatch.h.